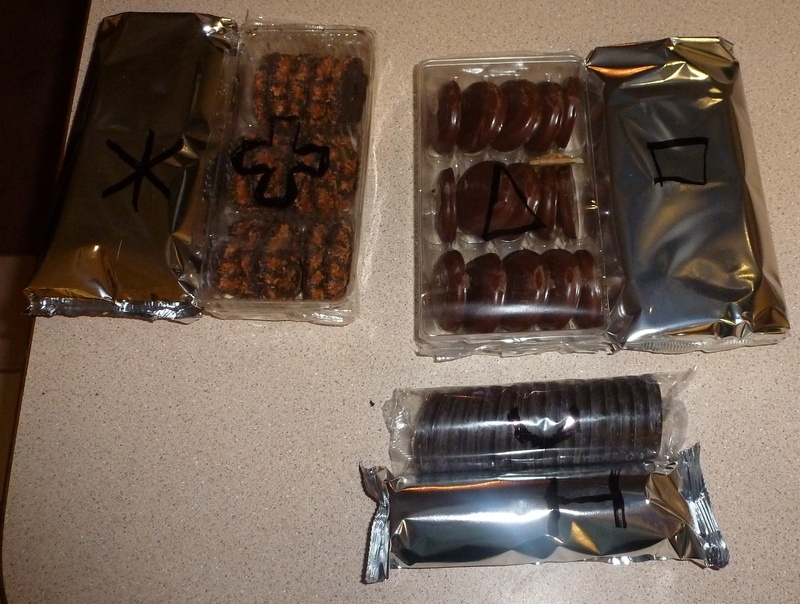 Beth removed each package of cookies from its box and labeled the wrapping with a symbol so the taste testers wouldn’t know which cookie went with which brand name. 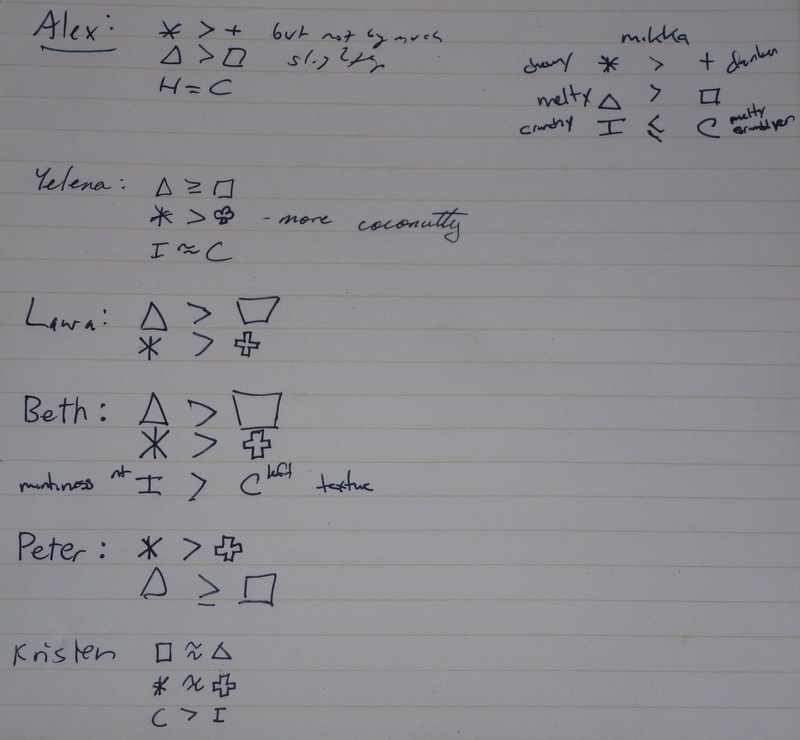 She had herself blindfolded and fed cookies by an assistant when making her own analysis. In all, 3 pairs of cookie varieties were compared by 7 participants, with unexpected results. Caramel Delights (ABC Bakers) overwhelmingly beat Samoas (Little Brownie Bakers). Tasters repeatedly cited the chewy texture of the Caramel Delight as the basis for their choice. The Samoas were more chocolaty (with dark chocolate instead of milk chocolate drizzle) and they had a more intense coconut flavor, but they had little caramel taste and were dry. Tag-a-Longs (Little Brownie Bakers) overwhelmingly beat Peanut Butter Patties (ABC Bakers). Their peanut butter and chocolate were both creamier, and the cookie was crisp without seeming dried out. Thin Mints were too close to call. The Little Brownie Bakers cookies had a slightly crispier texture, but the ABC cookies were a little mintier. In the end we were forced to admit that our childhood bakery was not necessarily better than the other one. Each bakery has its own strengths and weaknesses. We’ll be happier next year when we see Caramel Delights on the streets of Boston, and we’ll definitely make another trip to the land of Live Free or Die in order to stock up on Tag-a-Longs. 9 Responses to Cookie Showdown! I live in California, and I stopped buniyg Girl Scout cookies a long time ago. My granddaughers will not be in the Girl Scouts. The Girls Scout books and teachings are too much into radical feminism in some areas now. I buy from the Boy Scouts, though. Some Girl Scout groups are worse than others, but from what I have heard, the liberalism is coming down from the top and is infiltrating to the bottom. Some groups are fighting it though, but beware. You know this blog is based out of the People’s Republic of Cambridge, Massachusetts? This ain’t the choir you’re looking for, preacher. Whoa! How limited are we taniklg, here? Like limited as in it won’t be around in July? Because I NEED to try that Samoa ice cream! No fair.Also, great photographs as usual! I need you are Erica to give me a class when I get home! But there are still the same two bakers in Massachusetts that there are in California. Interesting! I live in California and recently got the chance to do a side-by-side taste test, but we got different results than yours. LBB won both Thin Mints and Samoas/Caramel DeLights hands down…ABC didn’t even come close with our testers. 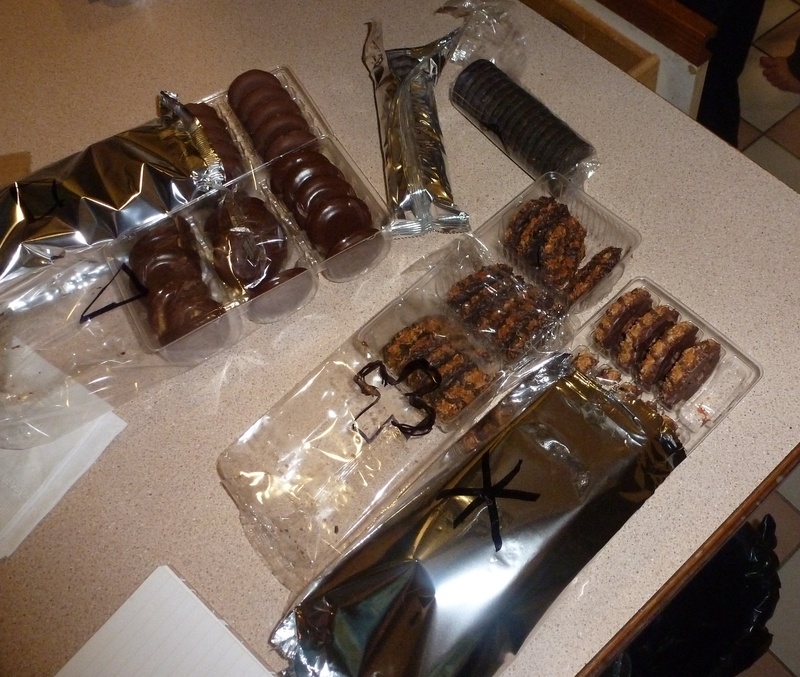 They felt that Caramel DeLights were very skimpy on the coconut and their chocolate flavor wasn’t nearly as intense, and the Thin Mints were judged mintier and crispier from LBB than from ABC. I was surprised to read ahnnyitg less-than-great about these bars. I made them this weekend for company and everyone loved them! But perhaps it’s because I didn’t have bittersweet chocolate and used semisweet instead? Whatever the reason, they were a hit. try these will semisweet cotlhcaoe instead! i promise you will like them better. not my fav recipe for TWD either but i still loved them! your smores cupcakes look great too!